Well, as you probably gathered from our mean-spirited review, we don’t like Star Fluxx much. We accept however that there are people out there that do, so even though we’d recommend you don’t play it we’re going to do a teardown anyway. But seriously, don’t play it. Just don’t. I can make out this info, but is it really worth it? The more of these teardowns we do here, the more apparent it is just how few manufacturers are even *aware* that colour-blindness is an issue they need to design around. It’s not a problem with the games, it’s a simple problem of presentation. 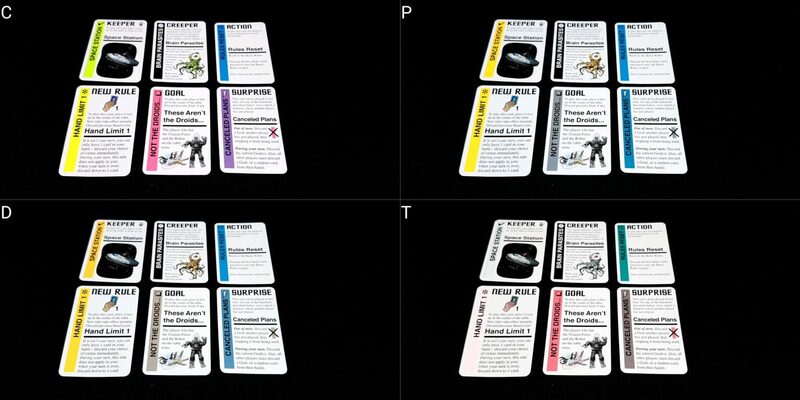 Literally all they’d need to do for Star Fluxx is to adopt a slightly different colour scheme. 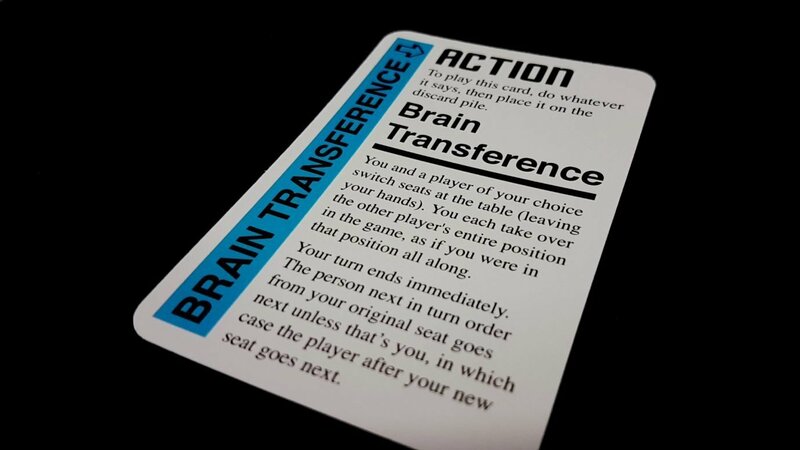 For blind and partially sighted players, we have bigger problems – the game is very highly state dependent, and all of that state is represented as written instructions across potentially dozens of cards (depending on the number of players). The contrast on the cards is at least reasonably easy to deal with, but there is often a lot of text tightly cropped into a reasonably small space. The implications of these rules may be spread all across the table making it difficult for those with visual impairments to read and comprehend. 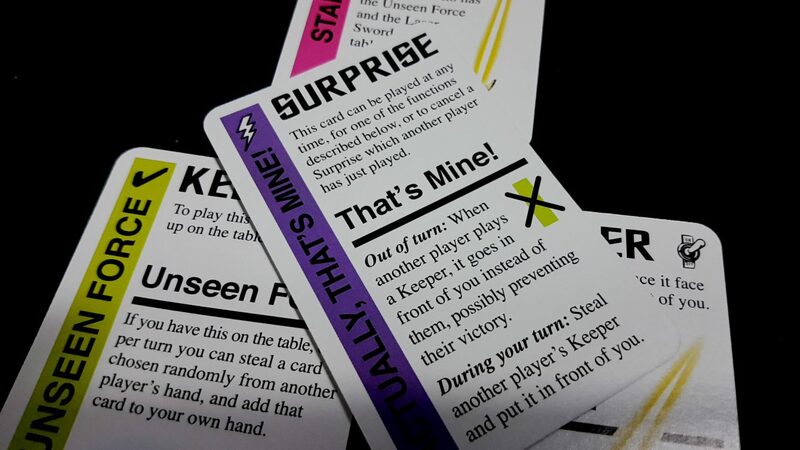 Game rules are impacted in many ways, including the keepers that have been played, the rules that are set out on the table, and the action/surprise cards that are played as the game progresses. we have six keepers, three rules, and two goals on the table. 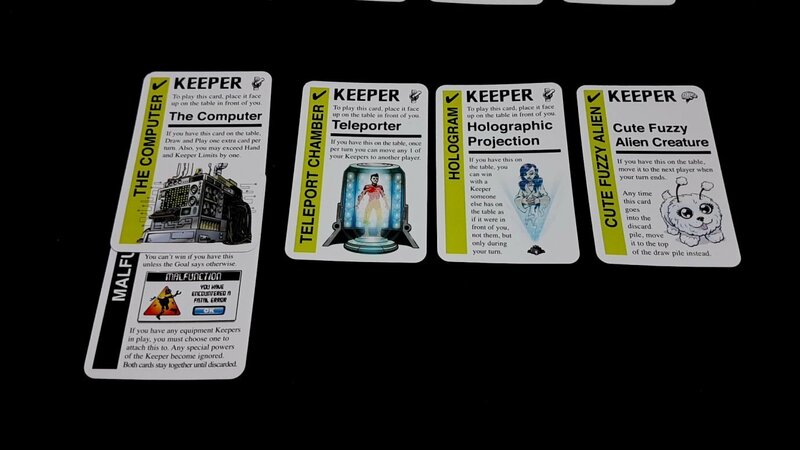 Most of the keepers have no special effects, but the Unseen Force allows a player, once per turn, to steal a random card from another player’s hand. The laser pistol allows a player, once per turn, to discard any keeper in front of any player, if it has a creeper attached. 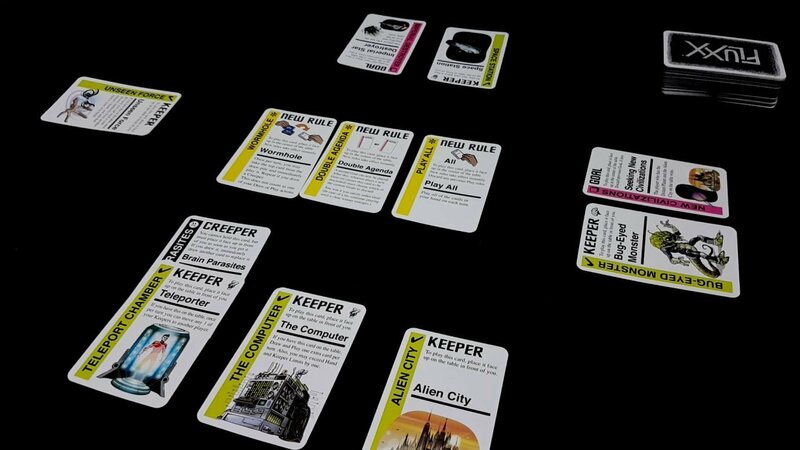 The Expendable Crewman means that if someone tries to take a different keeper from that player, they are forced to take the Expendable Crewman instead. Then, there are the two goals which can change any time another player plays a goal card – we have two here, because there’s a Hidden Agendas rule that means we can have double goals on the board at any time. Except don’t rely on that, because it may not be there by the time it comes around to you again. Then we have the rules, which currently set a hand limit of three, a draw requirement of four, and two active goals at a time. 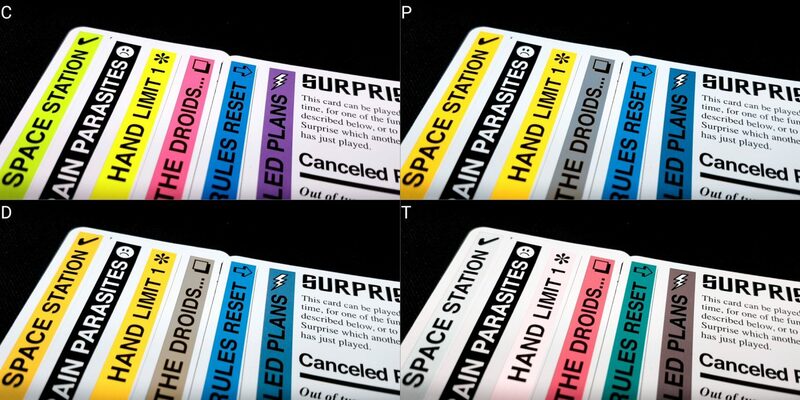 Now, this is what Fluxx is, but it causes a problem for those with visual impairments – there’s no real scope for *remembering* the context of state, or even making sensible use of hand management techniques. The effort you might invest into this can easily be undermined by someone just doing their normal turn. Nobody has to go out of their way to make this difficult for you, it’s baked into the design of the game itself. You can play this as someone that is visually impaired, but you’d need to have a strategy for dealing with the inherent variation that goes into rules and card combinations – the normal techniques of memorisation won’t cut it here. 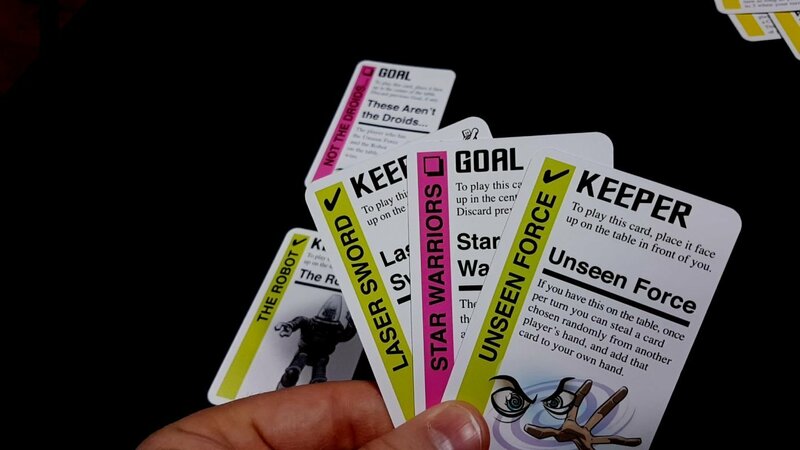 We tentatively recommend Star Fluxx for those with limited visual impairments – there are compensatory strategies that would work for playing it. We would be less willing to recommend it for more severe impairments due to the ever-shifting set of rules that need to be parsed. That is, unless you have someone willing to explain each turn what has changed and what it means for the keepers in front of you and the cards in your hand. So we have a keeper limit of three, which might change. If we go over that, we have to discard a keeper. We have a draw mandate of four. We need to draw four cards every time. But that might change. 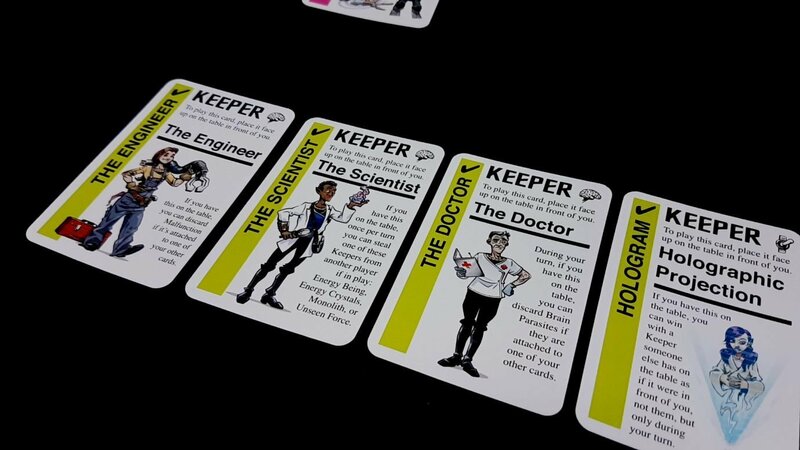 Then we need to play every card in our hand – we get to choose the order of the play, which is a massive cognitive burden considering the range of keeper effects and likely surprise cards other players may have. It’s easy, by playing cards in the wrong order, to hand someone a win. But don’t worry, that might change. 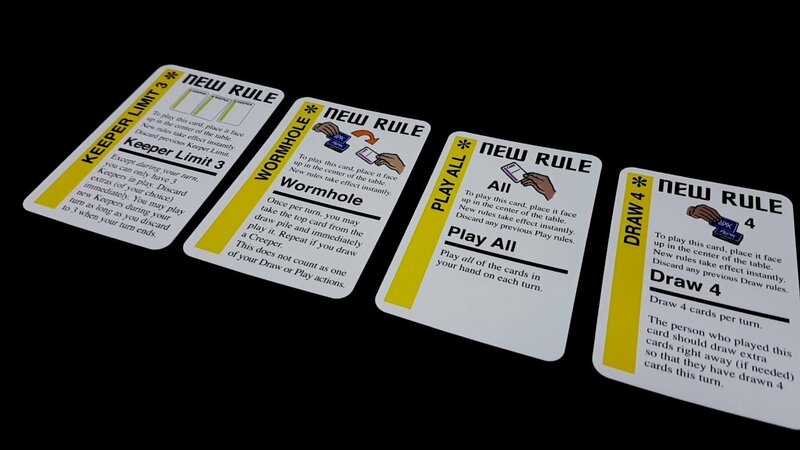 Then we have the optional ‘Wormhole’ rule – we can choose, if we like, to pick the top card off the deck. If we do, we have to instantly play it. We have The Computer, which lets us draw and play an extra card each turn, so we actually draw *five* and play all of them. But we also have a keeper limit of four, because the Computer lets us exceed the standard rule limit. 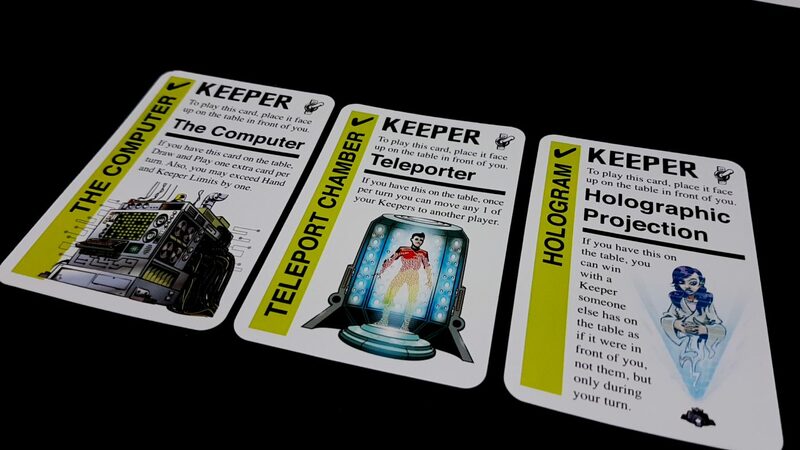 Once per turn, we can also teleport one of our keepers to another player. BUT, as far as win conditions go, we can use any other player’s keeper as if we had it in our possession, BUT ONLY when it’s our turn – so we can’t win when someone plays the goal or changes their keeper until the heavy weight of obligation comes around to us once more. By the time it gets to us, the goal may have already changed. That’s a lot to keep track of, and it might all be different next time. Which do we get rid of? Because we were fine with four keepers just a turn ago, and now we have to change everything. Moreover, while the text of all rules and special powers are written on the cards, you do need to remember how everything relates. By the time you’ve worked your way around the table once to work out the implication of a play, you’re already forgetting what you started out with. 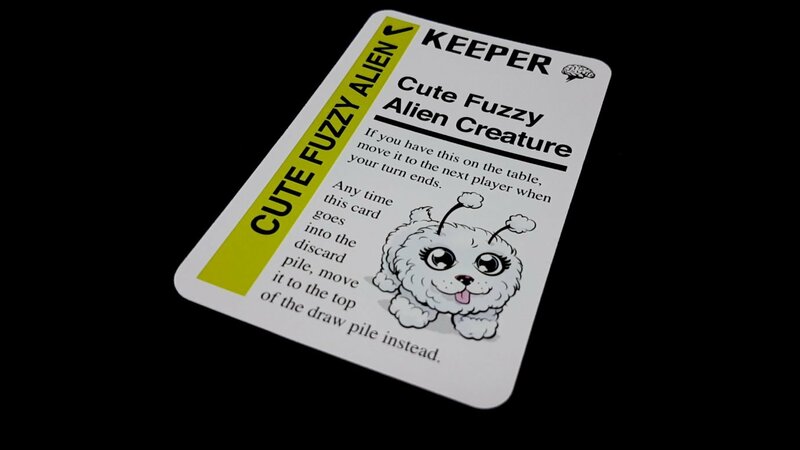 The reading level required of the game isn’t especially high – to its credit, Star Fluxx manages to keep the text at a reasonably low level of required vocabulary. However, the reading comprehension required is significantly higher because you need to understand how the rules work in the context of the current game. Player flow is reasonably consistent – you don’t usually need to worry about your turn being co-opted, but as we’ve discussed above game *flow* is highly variable. You need to keep on your toes to know what you have to do each turn. Combined with this, scoring is highly variable too – sometimes you’ll need just the exact combination of keepers in front of you (because of tight keeper limits). Sometimes you will have multiple goals you can work towards. Sometimes you can make use of the keepers around the table to win. Sometimes keepers you have available to you can’t be used for win conditions because of creeper effects. Scoring, as such, is either ‘win or lose’ but it’s not particularly easy to work out what that means on a turn by turn basis. We don’t recommend Star Fluxx at all for those with cognitive impairments. It’s our turn. We’re going to win! But we draw the Evil creeper, and need to attach it to something. When the evil creeper is attached, we can’t win with the keeper unless the goal says so. But you know what? That’s fine! Because look what we have! We have Star Warriors as a goal, and we have the laser sword we’d need! So we attach it to our robot. Sorry evil threepio, but we’ve got a galaxy to save. We play down the unseen force. We play down the new goal. Then we play down the laser sword with a triumphant grin. ‘Check…’ we start to say. They get to just… take our laser sword. Just take it. Away from us. Our laser sword. What the hell? So, we’re prevented from winning just because someone had a card that was the ‘hey, screw you buddy’ card. Man, you’d be justifiably angry. But surely that’s a rare scenario? Let’s look at another one. There’s a goal right there on the table. And we can win. We can actually play those cards. Our turn comes around next. The goal hasn’t changed. WE’RE GOING TO WIN! ‘You and a player of your choice switch seats at the table’. They grin at you. ‘Get up!’, they cheerfully order. They’re just going to take your winning hand. They’re going to take it right from you. You’re going to be stuck with whatever train-wreck of cards that they’re trying to escape from. I think, even without a behavioural disorder, you’d be well within your rights to flip over that damn table and yell obscenities at everyone until the police arrive. Even if these things don’t happen, it’s such an arbitrary, unstructured game that victory is a product of random alignment. Winning will slip in and out of your grasp constantly, and you’ll have no meaningful ability to influence it. We do not recommend Star Fluxx for those with emotional or behavioural disorders. Or for small children, or for anyone that actually wants enjoy playing a game. 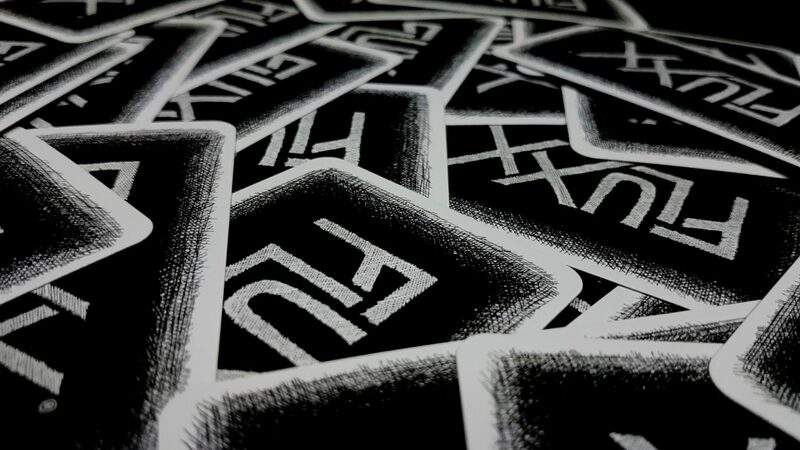 Physical accessibility is mostly fine – the cards can be ordered in a way that is comfortable to players, and the hands are made up of standard sized cards. The only issue is that hands *can* become quite large as you play, because rules combinations may require, for example, a draw of five and a play of one. In this case you’re soon looking at ten or twenty cards in front of you – multiple card holders would be required to support that with any degree of comfort. 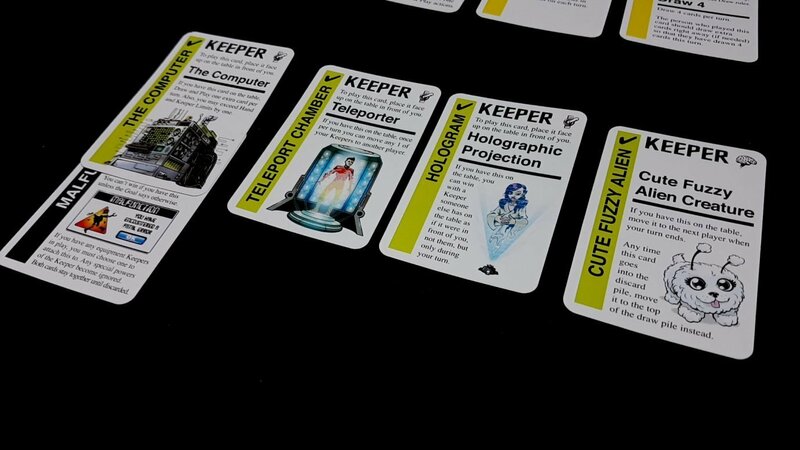 As with Suburbia, there’s a need for players to be aware of the keepers in front of other players. This is less significant an issue than it is for many games because only some keepers have special powers, and only some of these special powers are impactful on general game-play for other players. Still, you’ll need to be mindful of it – as long as people will respond when queried as to what their keepers are, you should be fine. No issues here, other than the usual issues of general communication that a game like this would raise. These are all day to day solved problems though. If sci-fi is an appealing theme, you’ll find little complain about in terms of the way it portrays diversity. In this, it does a significantly better job than much of sci-fi itself manages. It’s not a rich panoply of diversity, but it’s not bad. Cost-wise, it’s easy to recommend this – it’s as cheap as chips, and although you don’t get much for the money, you do get a fully featured game in the box. Very much recommended in this category. The changing rules we’ve outlined above, but these are especially problematic for those with visual *and* cognitive accessibility issues just because there is so much change. The whole game is about rules in flux (hence the name, of course) and so there’s no way around it – it just causes lots and lots of problems in terms of accessibility. This is compounded by the use of hidden hands, because for those with physical and cognitive impairments there is very little scope for other players to meaningfully assist in either hand management or hand comprehension. Hands often become very large, creating an intersectional issue for those with physical, cognitive *and* visual impairments. There’s too much hold, both physically and mentally. The game requires a minimum of two players, but supports up to six. There’s no clean mechanism for dropping in and out (your keepers can be kept in circulation through action cards, but your hand of cards can’t), but it would be easy enough to house-rule a ‘return cards to the discard’ rule to deal with this. The whole core of the game is the ever-changing rules though, so even if a player dropping out would leave the game in an otherwise unwinnable state, it won’t stay unwinnable for long. The game routes around this kind of issue, making it relatively low-cost for people to drop out and later drop back in. Similarly, it’s a game that is almost aggressively contemptuous of strategic planning, so there is usually little cost to someone else taking over another player’s hand for a while, or even until the end of the game. Lacking as it does meeples, dice or other tokens, most of the common intersectional issues are avoided. Even in terms of the symbology of the cards, it keeps it reasonably easy to parse – symbols are very straightforward, limited to ticks, arrows, squares and stars. None of them are core to understanding the way the game is played. Competition can be a significant intersectional issue, but here it’s mostly ‘win by unexpected conjunction’ – there’s a lot of messing each other around and screwing each other over, but very little of it is actively damaging in the long-run. In this respect, Fluxx’s biggest weakness as a game is one of its best features in terms of accessibility. Don’t play Star Fluxx. But if you must, provided you don’t have serious visual or minor cognitive impairments, we’d be prepared to recommend it as an accessible game. But just because you *can* play it, doesn’t mean you should. We gave it 1.5 stars, and the only reason we didn’t give it one single star is because tthat’s a rating I’m holding in reserve for Monopoly.